I have been lucky to visit this jewel of a city twice this year. It takes your breath away every time and you always find new spots to hang out in. Everything from gondolas to squid ink pasta to cuttlefish ravioli to millions of churches is pretty much outstanding. Go before it sinks! This was my favourite restaurant that we went to in Venice. It had an amazing atmosphere with tightly packed little wooden tables, friendly staff, cute buzzing kitchen and delicious food. I was recommended it by my friend Sophie and it definitely delivered! I just went on their instagram and saw that they even had Woody Allen eating there a few days ago. It's clearly a in-the-know place to eat! It's funny because you go down a few completely deserted streets to find it and there it is tucked away and full to the brim with people. I highly recommend the grilled octopus salad and the spider crab linguine (a Venetian classic). I actually went here as a second choice because another place that I had booked for dinner hadn't been great and so I quickly called Corte Sconta. They only just fitted us in and it was amazing! My cousin Andrew had recommended this restaurant to me after he had been working at the Biennale art show and he knows about his food. You can go for lunch or dinner and try to ask for a table in the garden which is pretty cute. The service is friendly with lots of lively waiters running about the place. We had sharing plates and I recommend ordering the special Venetian shrimps which are a cross between langoustine and a big prawn. They have a wonderful sweet flesh and come grilled with garlic and butter. You also need to go for their squid ink seafood pasta which was off-the-chain tasty. I heard their tiramisu was also very good but sadly they had run out by the time I needed one. This is such a stunning hotel and it is pretty famous for many reasons, mostly recently for George Clooney's wedding. It does not disappoint with it's gorgeous gardens filled with herbs and edible flowers that the restaurant use in their cooking. I loved the way the food for lunch was simple and classic but extremely good quality. I had a tasty aubergine tomato dish with a local cheese and a cod carpaccio which was out-of-this-world. You have to go and see the swimming pool and enjoy one of Walter (the barman's) iconic cocktails. We were lucky enough to try the new one that he has created with George Clooney himself called 'Nina's Passion'. It is a delicious elderflower liquor and champagne based drink with fresh passion fruit and micro herbs of fennel and sage flowers that is dedicated to Clooney's mother. Delightful! This was the ultimate ice cream experience! The gelato is presented neatly in perfect little glasses with equally cute cappuccinos to match. Nico is famous for the 'gianduitto' which is what I'm devouring in the photo. It's a beautiful combination of chocolate hazelnut gelato (gianduia) with whipped cream and it's dreamy! Even more wonderful that you get to lick away while watching all the boats go by in the port. This is one of the best markets I've been too! 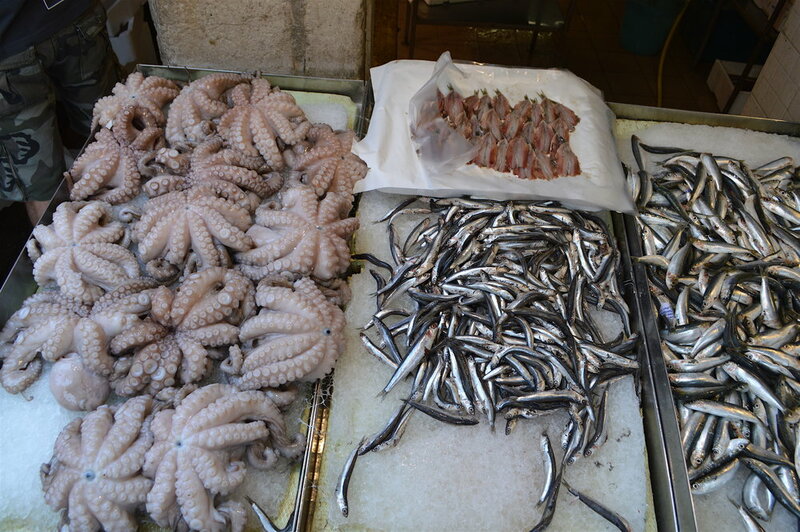 They have the most amazing quality vegetables and seafood. I literally wanted to buy everything in sight and bring it back home to my kitchen. The range of vegetables was insane! They had castlefranco lettuce, puntarelle, peeled globe artichokes, stunning cherries and apricots. This is where tourists come to see an Italian market but there are also many locals who come to do their grocery shop. We were staying at Ca'sagredo and so could catch the gondola across the water for €2 to the market side. It's worth going even if you only can buy some fruit for your journey home. This hotel is true Venice! 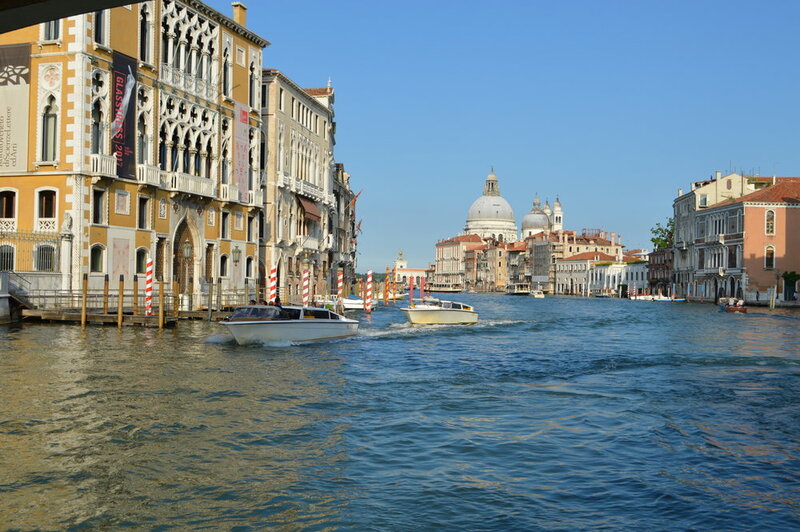 It is situated bang in the middle of the town by the Grand Canal and opposite the Rialto food market. I was staying here while I was in Venice and it is usually used for wedding venues as it is just so beautiful. The interiors are dark Venetian wood but with amazing light pink panelling on the walls. It is worth having a look round it's grand dinning rooms and staircases before sitting down to a dinner on the terrace overlooking the water. 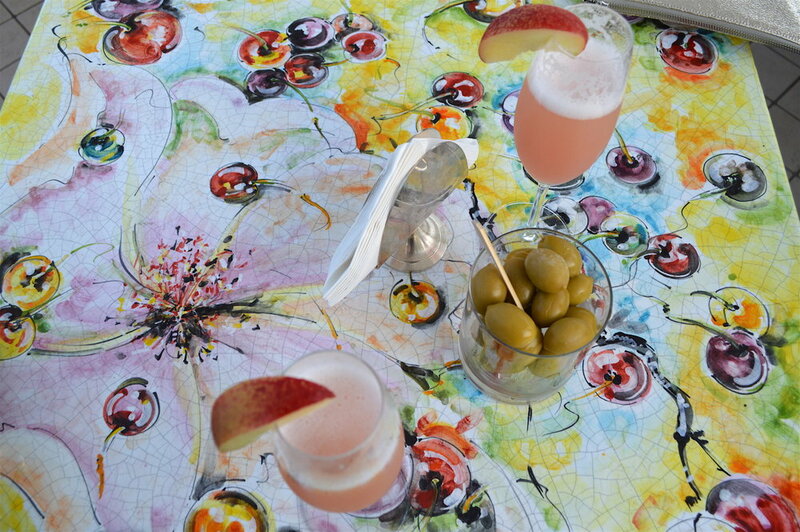 They also have a cute bar and terrace on the top floor where you can enjoy a cracking peach bellini (pictured). I went here for lunch just after arriving from the plane and it was the perfect meal to get me into the swing of things. Ask for a seat on the terrace to watch the gondolas go by or the interiors at nighttime are also quite cool. 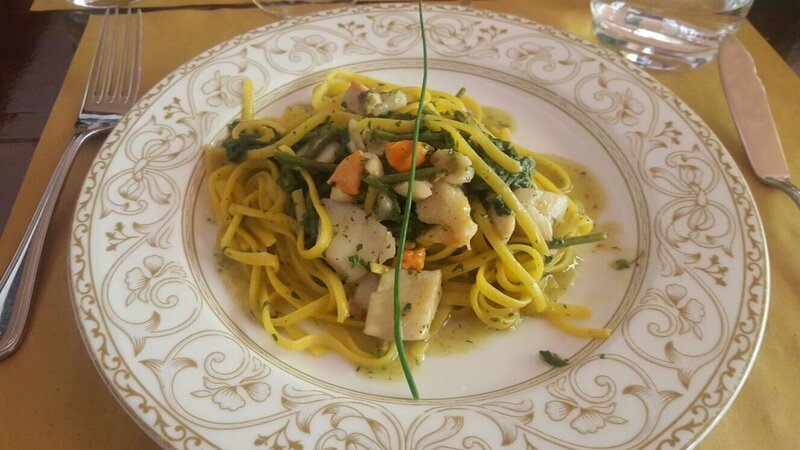 The service was excellent and you can find all of the usually Venetian favourites. I had a yummy pasta with green beans and clams. I sadly didn't get a chance to go to this restaurant but I will make it back one day. I have included it because my Italian God father, Tealdo recommended it to me and he knows his food. The photos look totally insane of these incredible looking pizza bowls stuffed with seafood and pasta. It really does have a lovely rustic Venetian feel to it! Go if you get the chance! Bene! Harry's Bar is where the peach Bellini was born and although the lighting is a bit stark and I felt like we were in a submarine I liked the waiter's slick outfits. The Americano with vermouth, soda water and Campari is also multo buono ! Grazie Harri! Last and by no means least! 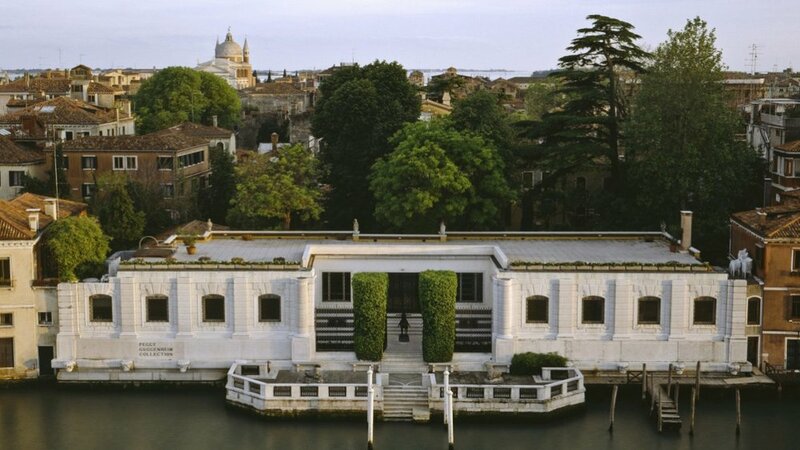 This was such a stunning collection of surrealist, impressionist and cubist paintings and sculptures set in a gorgeous white building overlooking the Grand Canal. Peggy knew her stuff and if you manage to go to one gallery this should be it!